Green beans. Ahhh the South’s staple vegetable. It goes with every summer dish and snapping beans is every unruly kid’s punishment. Growing up you don’t realize how fortunate you are to have a garden. Nor do you realize how fortunate you are to have parents that spend their days, nights, and weekends picking, stringing, snapping, and canning beans. Or any vegetable for that matter. There really isn’t any comparison to homegrown green beans. As I’ve gotten older I’ve had the desire to continue what I grew up doing. Raising a successful garden. One wouldn’t think so but I do believe there’s an art to it. Gardening is a continuous learning experience.. from plant placement to how much to plant of each vegetable. I guess that’s why I love it so much. Each year I have a better understanding and a better way to plant for the next year. I remember my mom telling me that with her first paycheck as a young girl she bought herself a pressure canner. How awesome is that? When Daniel and I got married she and my bonus dad gave us our first pressure canner. I couldn’t have been happier. Not everyone was blessed with the country experience as I was. I realize that. If you’re reading my blog you must have some kind of interest in owning a garden. And if you’re going to have a garden you’ll need to know how to preserve your vegetables. So if that’s the case you’re about to learn how to can green beans! First, I start off with washing my beans. I only wash once but I know some that will wash up to 3 times. After they’re washed I snag my husband and we string and snap over a good movie. Sometimes it feels like a race because we split the beans in half and see who gets done first. It makes it go by quick! Last year my mom taught me a trick of loading my jars, lids and rings into the dishwasher for a cycle minus the drying part. This cleans and heats them prepping them for canning. It worked great for me. Once I have our beans snapped to my liking and jars clean and hot I want get my pressure canner going. Keep your jars in the dishwasher until your ready to use them. If you dont feel comfortable with the dishwasher method you can always boil your jars, lids, and rings. ALWAYS check your pressure valve. I’m not sure that that’s what it’s called but your pressure canner manual will elaborate on this step. You really shouldn’t skip it because you want to make sure your canner can vent properly. I go ahead and fill up a pot of water and set to boil. I will use this to ladle over my beans. Okay, I put around 1 1/2″ of water in the bottom of my canner, then I put a cap full of vinegar in with the water. Next, I get my quart jars out. Normally this is a team effort with Daniel helping me pack jars full of beans. Once we have around 7 quarts packed I get the canning salt and put 1 teaspoon in each jar. Followed by hot water until it’s about 1/2″ from the top of the brim. I then take a utensil to remove any air that may be caught amongst the beans. Submerging it into the jar with the beans will stimulate the air to surface. Once this is done we can apply the lids and rings! Once the jars are sealed tight with lids and rings, I place them onto the wire rack in the canner and then put the lid on. Now, turn on the burner to the canner (medium high). Place your weight on the canner and make sure it’s set for 10 pounds pressure. As soon as the time is up, urn off the burner allowing the pressure in the canner to drop. On my canner there’s a red button that will fall in when the pressure has been released. I know then it’s safe to take off my weight. DO NOT ATTEMPT TO OPEN THE LID BEFORE IT HAS COOLED AND RELEASED ALL THE STEAM. I let it sit a few minutes more before I take the lid off. I use a ‘jar grabber’ (Ha!) to move the quarts to a kitchen towel on my counter. Of course you’ll have to repeat this process until your beans are all canned. 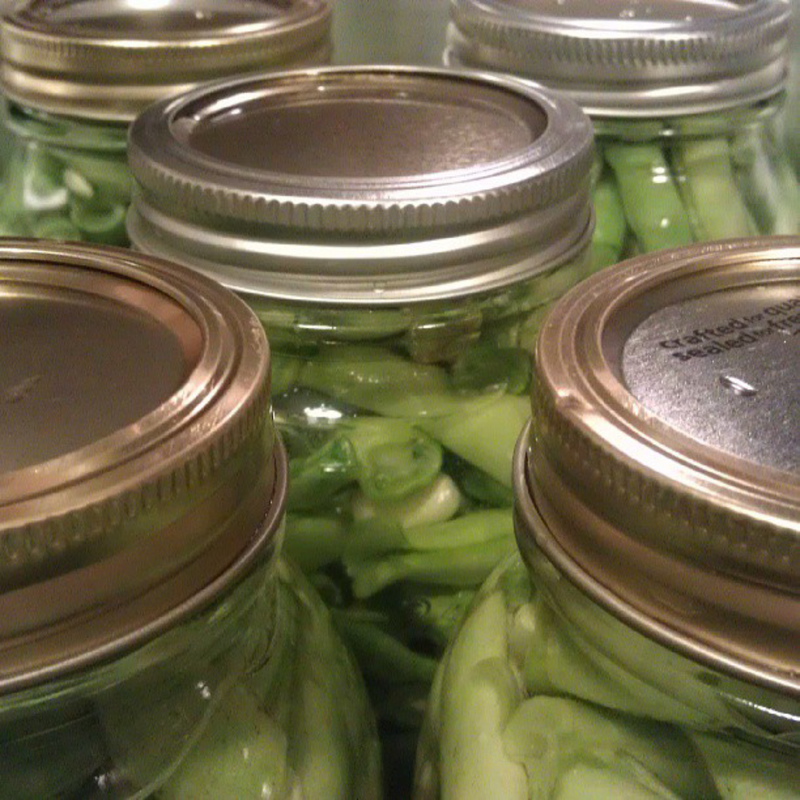 Then you can sit back and wait for the jars to sing. I’ve told my mom countless times there’s just not a better sound than the sound of your jars sealing. You’re able to enjoy your gardens treasures year around once you learn to preserve your veggies. So go ahead and mark “beans” off of your grocery list.